IYD celebrates the new season by transitioning to new co-chairs for year 2019. Wafa Taftazani (Y20 Delegate China 2016) and Melvin Hade (Y20 Delegate Germany 2017) had dutifully accepted their nominations and will replace our outgoing co-chairs Biondi Sima (Y20 Delegate Turkey 2015) and Zeva Sudana (Y20 Delegate Australia 2014). Both co-chairs had previously served as Board Members. Below are their updated profiles. We would also like to use this opportunity to thank Biondi and Zeva for their service in the past two months, whose vision and programme have expanded IYD’s capacity and brought the organizations into a new height. We are optimistic that this legacy can be carried out even further and beyond under the current leadership. Wafa Taftazani currently works at Google as Country Strategic Partnerships Manager for YouTube, and is also a Co-Founder and Commissioner at Modal Rakyat, a financial technology platform. He earned an MBA from the University of Cambridge with a full scholarship from LPDP, and a BA in Political Science with a focus on International Relations from Parahyangan Catholic University. "Untuk membagi pengalaman OGP Summit 2018, Sekretariat Open Government Indonesia bekerja sama dengan Indonesian Youth Diplomacy (IYD), dan didukung oleh Cocowork yang merupakan jaringan coworking space terbesar di Indonesia, akan melaksanakan sebuah kegiatan yang bernama OGP Summit Georgia 2018: Youth Talk. Kegiatan ini bertujuan untuk membagikan pengalaman delegasi yang berpartisipasi dalam OGP Summit Georgia 2018 di masyarakat khususnya di kalangan anak muda termasuk siswa dan mahasiswa. Proses dari kegiatan ini akan melibatkan anak muda yang masuk dan berupa sebuah seminar kecil yang akan membahas isu-isu yang akan dibahas dalam Open Government Summit 2018 di Georgia dan memberikan sekilas cuplikan kegiatan delegasi Indonesia yang menghadiri acara Summit. Yuk daftar! Kursi terbatas untuk 30 orang: bit.ly/ogiyouth. "Setelah studi, mau ngapain? Kenapa belum bekerja? Kapan kamu bakal nikah? Setelah masuk ke jenjang karir, apa nih step berikutnya? Kapan punya anak? Kenapa kamu berhenti bekerja?" 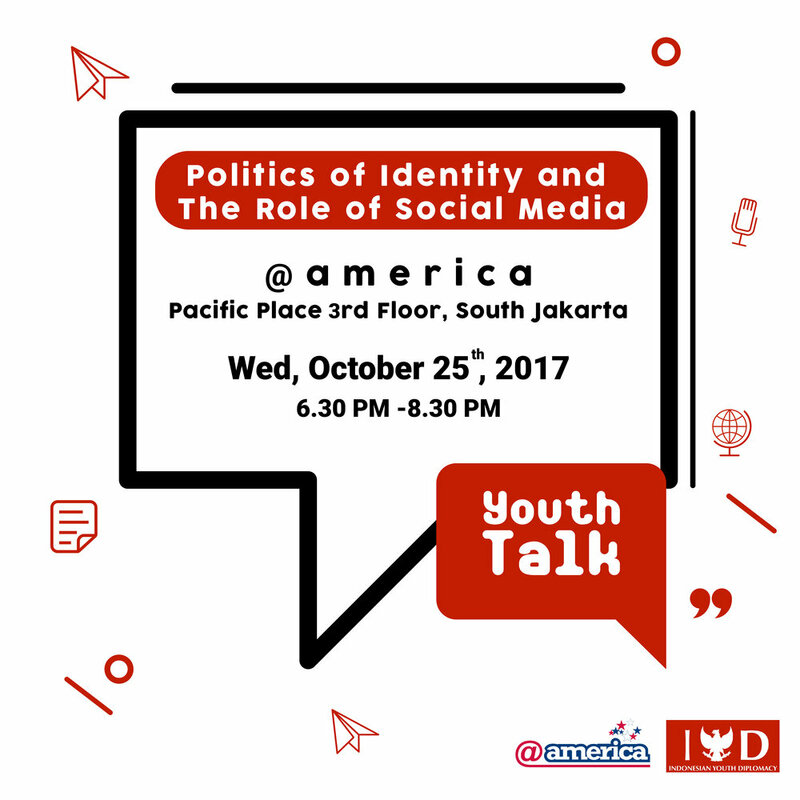 Acara yang disebut IYD Youth Talk 2018 ini akan diselenggarakan pada hari Sabtu, 10 Maret 2018 di Perpustakaan Nasional Republik Indonesia pk 13.30-15.30 WIB. Terbuka untuk perempuan dan laki-laki! Pertemuan ini akan dihadiri narasumber kece dari UN Women Indonesia yaitu Irantoni Alumna (yes, men can support women empowerment too and vice versa!) dan aktivis perempuan Anindya Vivi, lalu diikuti sesi FGD bersama tim IYD. Tidak ada biaya apapun, namun segera daftar ya karena tempat terbatas! Daftar jadi bagian IYD Community, yuk! Acara ini terbuka untuk perempuan dan laki-laki. Mari beri tahu kami di sini bahwa kamu telah mengonfirmasi ketersediaan kamu. Mohon centang 'Ya' hanya bila kamu benar-benar yakin akan hadir. Jika kamu memutuskan untuk berubah pikiran dan tidak dapat hadir, mohon beri tahu kami paling lambat pada hari Kamis, tanggal 8 Maret 2018. Kami mohon maaf, IYD tidak akan menanggung kamu pergi ke dan dari acara ini. Thank you for your application! We will notify you via email on Wednesday the 7th of March if you have secured your seat or are listed in our waiting list! Terima kasih teman-teman atas ketertarikannya! Kami akan memberitahu kamu melalui email pada hari Rabu tanggal 7 Maret jika kamu telah mendapatkan quota tempat duduk atau terdaftar dalam daftar tunggu (waiting list) kami! 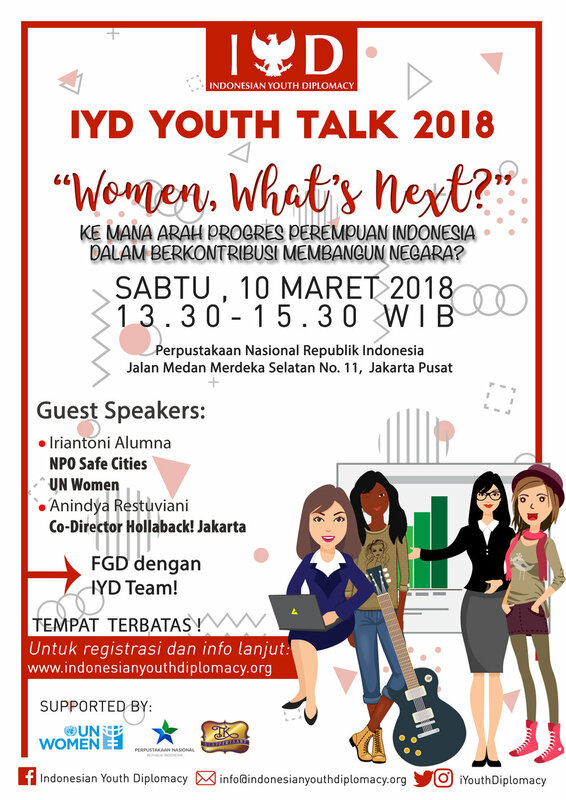 Yuk meramaikan peringatan hari perempuan Internasional tanggal 8 Maret 2018 dan sampai bertemu di IYD Youth Talk di tanggal 10 Maret 2018! Stay tuned for more info (very soon)!! 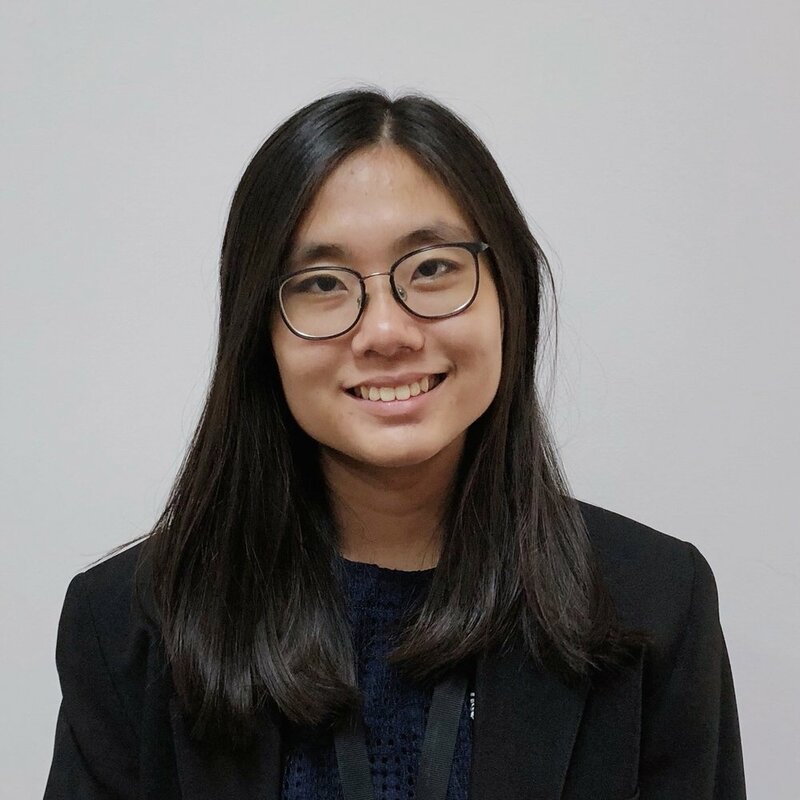 Following the previous announcement on the new IYD's leadership, we are pleased to announce that Zeva Aulia Sudana has also been appointed as IYD's co-chair. Together with Biondi Sima, Zeva will replace Gracia Paramitha and Kania Muksin who had served IYD as co-chairs in 2014-2016. Zeva Aulia Sudana is currently an Outreach Officer at the Tropical Landscapes Finance Facility (TLFF). She is also an active freelance consultant for multi-stakeholders. She was a Communications Officer and Green Education Consultant at the United Nations Office for REDD+ Coordination in Indonesia (UNORCID). She was a Program Officer in Search for Common Ground (SFCG), an INGO in the fields of conflict transformation and peacebuilding. She has travelled to various parts of Indonesia to conduct grassroot programs. She is a member of CAUSINDY since 2015, an alumnus of Istanbul’s Bilgi Üniversitesi Summer School on International Politics in 2012, scholarship recipient of the 2011 Study of the United States Institutes (SUSI) - Religious Pluralism in America from the US Department of State’s Educational and Cultural Bureau, and alumni of the 2010 Sekolah HAM untuk Mahasiswa / Human Rights School for University Students (SeHaMa) held by NGO KontraS. Zeva very much appreciates music, arts and culture. As co-chairs, Zeva and Biondi will join forces with a Core Team consisting of highly qualified individuals who were all part of previous Y20 Summit delegations. Profiles of each IYD Core Team member this year can be seen in this page. Core Team will run IYD's governance for the entire year to come. 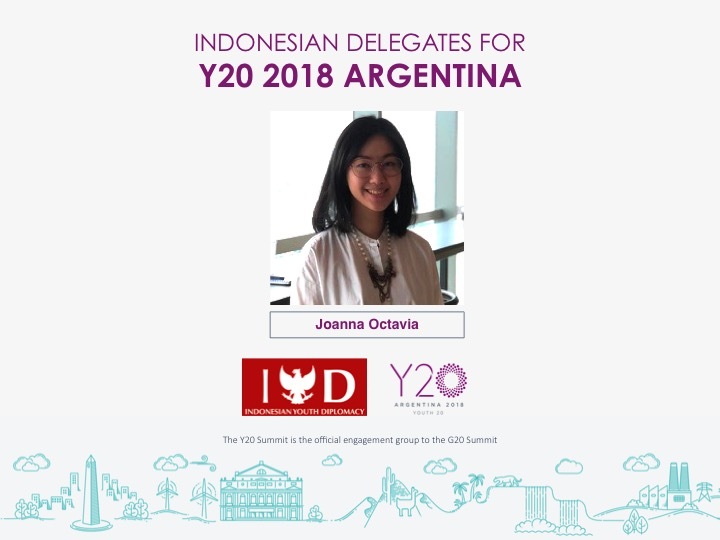 Recruiting for Y20 Summit / G-20 Youth Engagement Group and liaising as youth focal point to G20 Sherpa Indonesia and to the global network of IDEA (The International Diplomatic Engagement Association) are among the flagship programs IYD has dedicated itself to. After the conference was wrapped up, we still had one agenda left: visiting the Indonesian embassy in Ankara. We took a high-speed train from Istanbul, taking around 3 hours while indulging our eyes on the beautiful Turkish countryside. The high-speed train station in Pendik, Istanbul. The discussion in Ankara was attended by various embassy officials and Indonesian students, not only from Ankara, but from other cities in central Turkey. On behalf of IYD, we also presented a token of appreciation to Mr. Alamsyah, our Counsellor at the embassy. The discussion covered what we did in the conference, presentation of the communiqué, and what IYD does. The participants were engaging with their questions, particularly on unemployment and peace topics. One of them even promised to join the application for next year's delegation! Our only regret was the engaging discussion stole time from our dinner time, but it was definitely worth it. Mr. Alamsyah, Counsellor at the Indonesian Embassy to Turkey, in his welcoming remarks. Our mandatory group photo in batik (and udeng!) in Ankara. 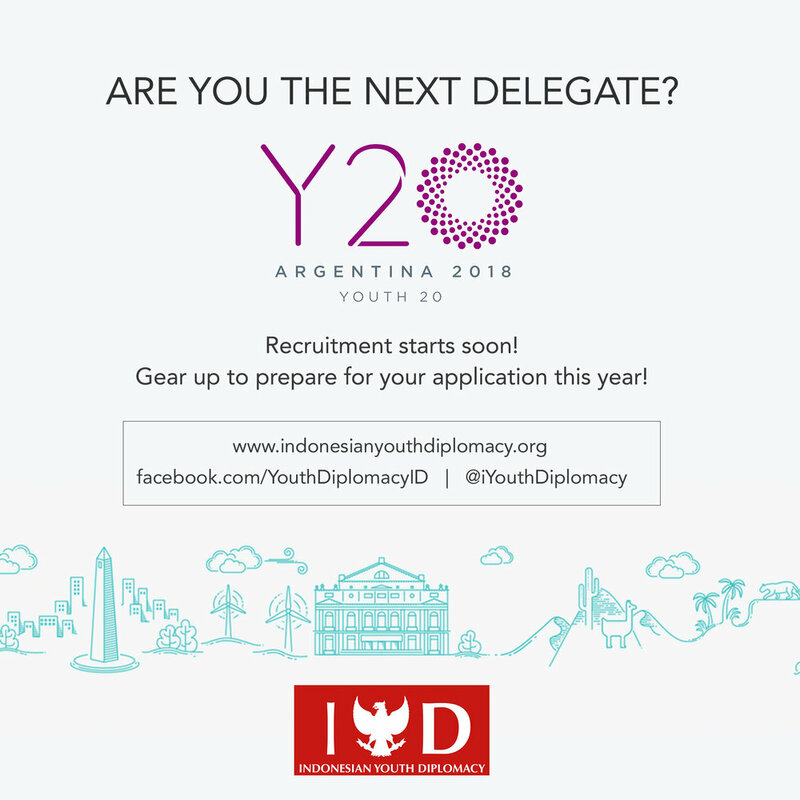 For more updates, follow us on Twitter@iYouthDiplomacy or our Facebook page. For more information on Y20, visit www.y20turkey.org. After the official closing of the Y20 Summit Turkey, delegates have a day of relaxing and fun. Some chose to explore Istanbul. Some went to Canakkale for a historic trip organized by Y20 Summit committee. Adiska and Kristia decided to go to join the Canakkale trip. Canakkale is about 300 km from Istanbul. We took a 5-hour bus drive to Canakkale. Canakkale has sites for both ancient and modern history of Turkey and the world. We visited Troy, the ancient city where the well-known Trojan War took place. Then we went to see the ruins of the Temple of Athena in an ancient city of Assos, located on top of Behramkale village. From visiting ancient cities, we then went to the sites of the World War I. We went to see the statue of Corporal Seyit and learned the story of this Turkish war hero. We also visited the Martyrs' Memorial and the 57th Regiment Memorial, both memorials of those who died in the Gallipoli campaign of the World War I. These visits reminded us on the atrocity of wars. Diplomacy is key in preventing wars, and this should start in youth. Y20 Summit works to promote such peaceful diplomacy between youths of the world. In the last day, all delegations split into two groups: while the head delegates must endure over 7 hours of non-stop negotiation finalizing the communiqué, the rest had the chance to visit a complex of historical sites in Istanbul. Sultan Ahmet neighborhood hosting Istanbul's finest landmarks, such as Topkapi Palace and Hagia Sophia, was easily picked as Y20 tour destination. Meanwhile in Boğaziçi University, Head Delegates must go against each other's heads, trying to squeeze the final communiqué more dense and compact. The intensity radiated well beyond the Rectorate Hall, the meeting room, as delegations were waiting in anticipation to how the final communiqué would sound like. After two hours extension, the agitated crowd finally breathed in relieve as the final communiqué was presented in front of Turkish presidency. The 3 pages final document, consisted of 3 clauses on Youth Unemployment, 10 clauses on Education, and 5 on Peace, would then be forwarded to the G20 Leaders Summit this November in Antalya. Final sessions were made for Head Delegates to refine the final communiqué, by which 2/3 of the draft evaporated as most clauses were merged into three pages. Indonesian Delegation deserves a pat on the back for having tirelessly fought for its national objectives of bridging urban-rural education gap, promoting teaching profession and quality, and ensuring access to market and mentorship for youth entrepreneurs, of which were all well-represented on the final communiqué. The closing ceremony was marked by a speech from the Organizing Committee, and the troika, consisting of past, present and future hosts of Y20/G20 Summits. Delegations were then escorted to take a final picture, only to be pleasantly jaw-dropped once again with the fact that the final photo session was taken by a drone! The day ended with a gala in Çadir Köşk, another well-selected venue with astonishing ambience. Final communiqué was presented and well accepted by the Turkish Presidency. It's a wrap: the Gala Dinner marked the bittersweet of the last conference day.